Today in Weston; June 11, 2018. A beautiful ‘spring’ day along the Pan Am Path that runs below and to the West of Weston Road. There’s a whole different world by the river in Cruickshank Park. This evening, a cyclist travels north towards where the trail ends at a set of steps (St Phillips and Weston Road). This part of the trail was built in 2013 and hopes were high that it would continue north. Instead, cyclists must haul their bikes up the steps and continue along Weston Road to Fairglen (where the trail continues) with fading sharrows their only protection from busy traffic. If the stair climb doesn’t get you, a driver on Instagram will. The end of the trail. Councillor Nunziata assures us that negotiations are allegedly ongoing with the landowners whose properties lie between one part of the trail and another. WestonWeb has long campaigned for a better network of bike paths and trails. Alas, five years later, we’re still waiting. Update: for reference, here’s a picture of the stairs from the trail end to street level at Weston and St. Phillips. Climbing this is no mean feat. Author Roy MurrayPosted on June 11, 2018 June 15, 2018 Categories Cycling, Environment, Frances Nunziata, OpinionTags Cruickshank Park, cycling, Pan Am Path, Toronto Cycling Network Plan, Weston Road6 Comments on Today in Weston; June 11, 2018. Weston, home of the Bicycle? Get real. This is a supplement to Adam’s excellent ‘Tyraid‘ published in 2015. At one time in Weston there was a CCM (Canada Cycle & Motor) factory that made bikes. Some time after the factory closed, Weston (through its Business Improvement Area) decided to call itself ‘The Home of the Bicycle”. In recent years, Weston’s relationship with the bicycle has been marred by infidelity. Weston’s true love is clearly the car and bicycles are given the literal cold shoulder. Instead of encouraging cycling as a way to get around, our own councillor has in the past voted against bike lanes and has even proposed licensing bicycles – an idea that would curtail bicycle use. More evidence of infidelity: not a single dedicated bike lane graces Weston’s streets; hardly surprising when we live in one of the few cities in the world without a single pedestrian-only street. The nearest thing we have to a bike lane in Weston is a set of ‘sharrows’ down some pretty busy stretches of Weston Road. What are ‘sharrows‘ you may ask – simply a set of stencilled chevrons and a bike image to indicate that cyclists may be present. Somehow a few licks of paint seem to allow politicians to believe that bikes are safely accommodated on our roads. Incidentally one particularly dangerous stretch of Weston Road links two strands of the once vaunted Pan Am Path. Updated map showing the multi-use trail along the Humber in Weston and the missing section between (south to north) St Phillip’s Bridge/ Weston Road and Fairglen Crescent / Cardell Avenue. Negotiations to connect the two halves of the trail have been ongoing for a long time. It has been shown that people who bike regularly are healthier and happier than those who don’t. The ones who don’t get hit by a car that is. Many cities around the world have found that by creating separate bike lanes, accidents fall off dramatically while cyclist numbers rise. Health care costs decrease too when large numbers cycle and the population becomes healthier. Plus we’re not talking about cities with nice climates either. Scandinavia can have some pretty foul winter weather yet cycling is used by a majority to get to work in Copenhagen. In fact, 63% of Danish MPs commute on a bicycle. Stockholm has an extensive network of separated bike paths running through the city. The author impressed by the support for cyclists in other countries – this is also in Stockholm. Councillors from the suburbs who live in their own version of the 1950s often put forth bogus arguments when blocking pro-bicycle council motions: Cyclists blow through stop signs, they don’t pay for the roads etc. There’s a nice rebuttal to that nonsense here. Read here to learn what other cold climate countries are doing to encourage cycling through the use of bicycle highways. Bottom line; if we want to be the ‘Home of the Bicycle’, let’s do something meaningful. Mount Dennis is opting to be a ‘net zero’ community and has made great strides towards that goal. Weston really could be the home of the bicycle. If the political will isn’t there, nothing will happen. If people don’t tell politicians what’s important to them, nothing will change. Few people are brave enough to risk life and limb cycling alongside cars. Build separated bike lanes and people will use them. Not only that, cyclists spend deceptively more money. Let’s make Weston the ‘Home of the Bicycle’ through purposeful actions; not through the use of a now meaningless name. Note: an earlier version showed an out-of-date map. Thanks to Simon Chamberlain for the heads up. Author Roy MurrayPosted on May 22, 2017 May 30, 2017 Categories Business, Community groups, Cycling, Opinion, TrafficTags cycling, Pan Am Path, Toronto, Toronto City Council, Weston BIA, Weston Road3 Comments on Weston, home of the Bicycle? Get real. Your humble correspondent somehow missed a big, beautiful story. Though we covered one section of the Pan Am Path mural, somehow an equally wonderful section missed my attention. Just a little further up the path, past the break and under the 401, the Essencia Art Collective created an amazing mural of trippy, gritty art over 8 days in May. I offer this as compensation for my failures: I found out that this is also the group that made the fantastic aquatic mural as you pull off Black Creek Drive onto Jane. 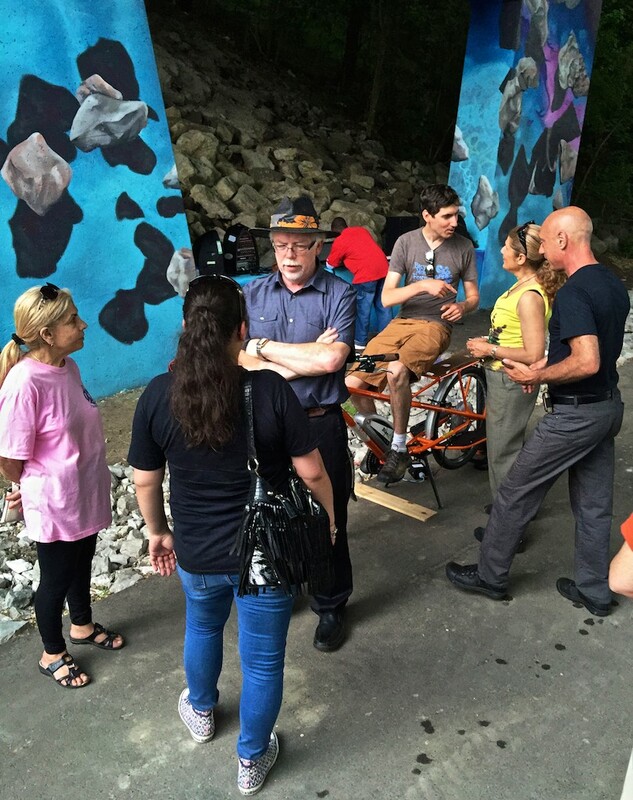 Politicians from all three levels of government were on hand for the official unveiling of the UrbanArts mural under the St Phillips Road Bridge. From left: Councillor Frances Nunziata, MP Mike Sullivan (in hat) and MPP Laura Albanese (in yellow). Urban Arts entertains the crowd. 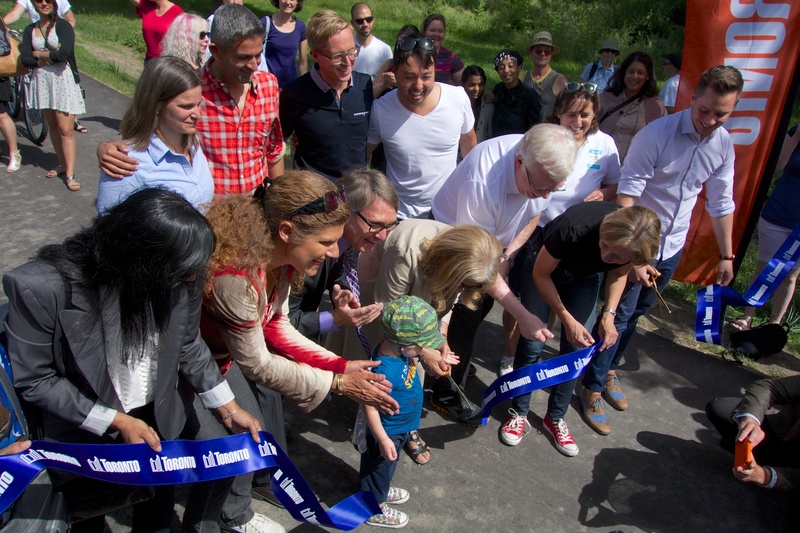 Another link officially opened today in a major step towards completion of the much anticipated Pan Am Path. This 84km path is being created by linking existing shorter trails and will eventually allow pedestrians and cyclists to move from Brampton to Pickering without encountering motor vehicles. After the ceremony, a Jane’s Walk took pedestrians along the path and a group of cyclists followed later. Bike Share Toronto (formerly Bixi) had bikes for those wishing to try the new link. Dynamic youth support organization UrbanArts provided music and an art activity for the celebration. One of the more distasteful aspects of these events is the unseemly scramble for credit. Political representatives from all three levels of government were jockeying for position. 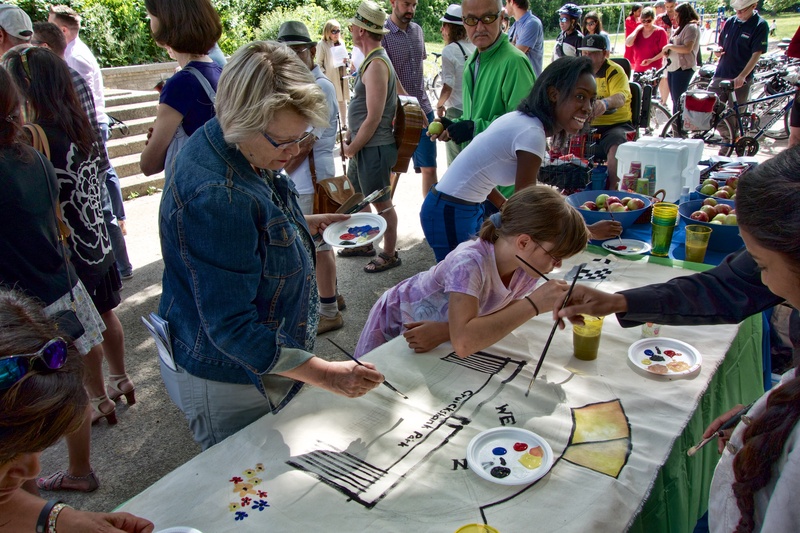 Freshly re-elected MPP Laura Albanese announced a $400,000 grant from the Trillium Foundation to be spent on projects covering the length of the trail (strangely the Trillium Foundation site has no trace of this in their list of grants). Councillor Frances Nunziata announced (again) the $48,000 worth of exercise equipment to be installed in Cruickshank Park (well before the Council election in October no doubt). This money was extracted from several developers in exchange for Council concessions. Another guest speaker, Etobicoke Centre Tory MP Ted Opitz prattled on about his support for the path despite the Federal Government contribution of precisely zero to this project. It takes some nerve to remove protection from the Humber River (as the Tories have done) and then bask in the glory of others’ work. Then again, there will be a federal election by October 2015 at the latest. Right leaning mayoral hopeful Karen Stintz was in attendance but mercifully kept a low profile (until the ribbon cutting). Incredibly, our own MP Mike Sullivan told me he was not invited and therefore didn’t get to speak. 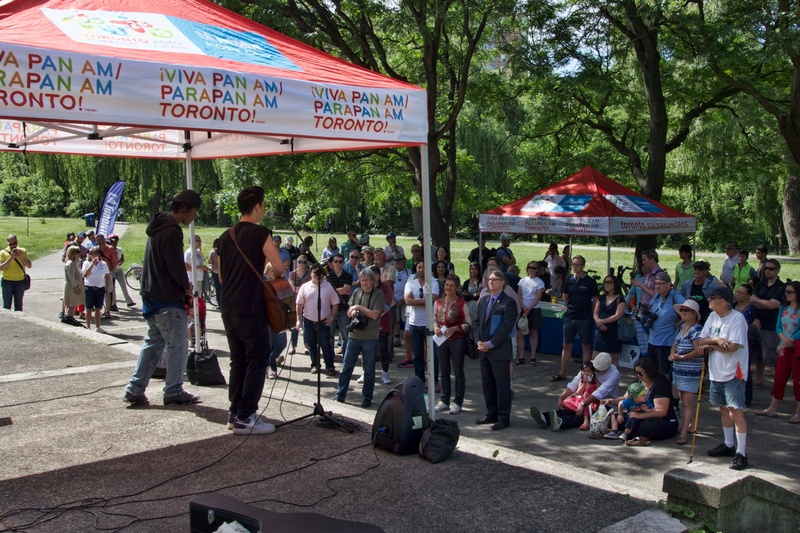 Organizers from Friends of the Pan Am Path claimed there had been an oversight. Brent Chamberlain (Friends of the Pan Am Path) and Frances Nunziata (with scissors) cut the ribbon.